Knitted toys for children and more. I always feel that there is something magical about finding a four leaf clover. Today I found one while I was in the garden. Whenever I find one, I tend to press the leaf in a book and save them. 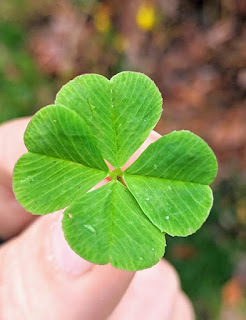 Then these dry four leaf clovers are a nice surprise waiting to be discovered by someone while reading a book. Way back in winter I had a toy mystery KAL. It was Camille. 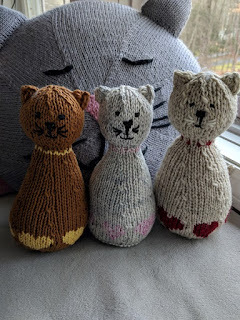 Afterwards I had a fun KAL devoted to Cats in my group on Ravelry. The grand prize for this was pick my new toy design. Dasher is that toy design. 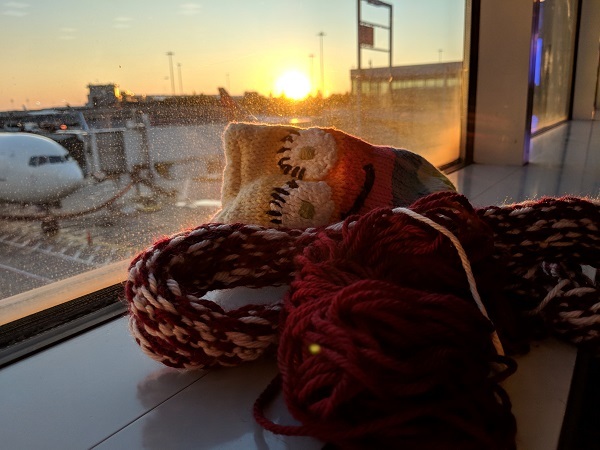 It will be also our spring toy mystery KAL. 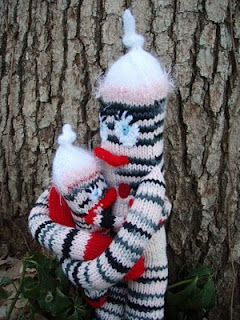 To participate in this new toy mystery KAL simply join my group on Ravelry, download the pattern and knit this new toy. It is fun and the first clue will be released this Monday. When working for a third party, creating a knitting pattern comes with deadlines. 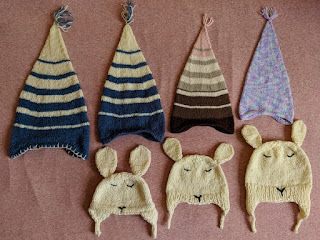 The whole process of creating a knitting pattern from an idea to a final product takes months. It does not mean that I personally have months to work on the knitting project, but rather that the entire process from sending a submission, being accepted, receiving the yarn, creating a prototype sample, writing the pattern, working closely with the sample knitter, and technical editor, reviewing the edited pattern, then reviewing the final pattern, and finally seeing the pattern published in a book or in a magazine takes months. Luckily I have a box of yarn that belonged to my grandmother at my mom's home. In a way it is a treasure box as it does contain more than remnants of odd yarns my grandmother used, it also brings out the memories of my time I spent with her. When I arrived to my mom's place I opened the box of yarn and looked through. I picked some yarn and started to work on the patterns. After I finished the hats, I kept the notes but gave away the hats to my nephews and my friends' children. Something Fishy is another dishcloth I have created for Knitpicks. 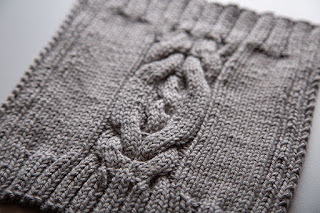 It is a fun and fast knit, in garter stitch with some increases and decreases to create the fish shape. 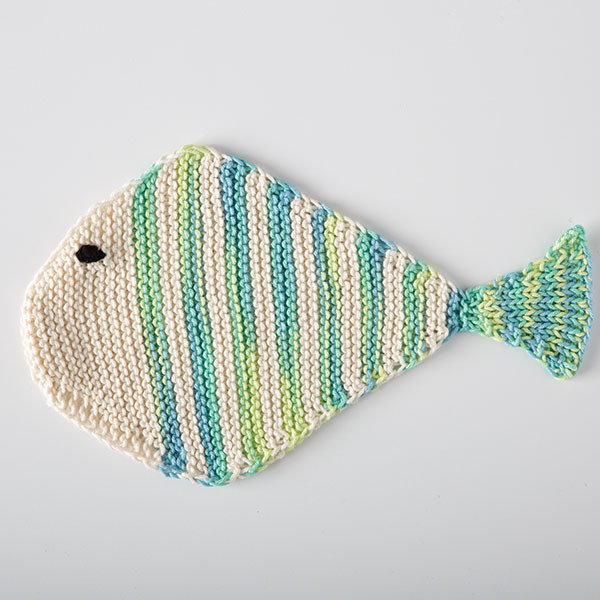 A perfect washcloth for bath time or to have few more helpers for the cleaning choirs around the house. Sometimes I write patterns for third parties. This Foggy Paths Dishcloth is one of them. It was published by Knitpicks as a part of their free dishcloth series on their website. It is already March, I cannot believe how fast the time slipped away. 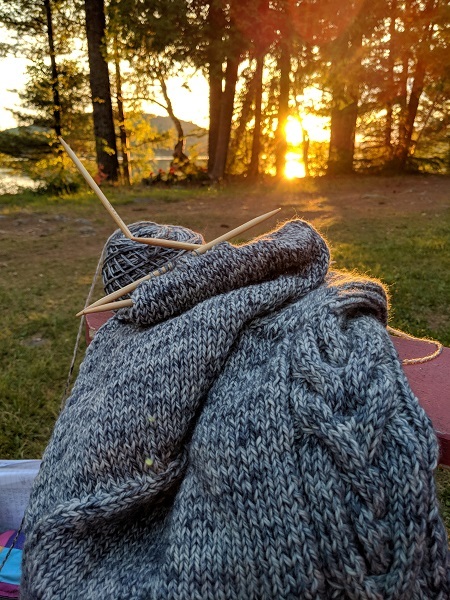 I finally finished the pattern for the Voyager Sweater. It started about a year ago, when I made the first sketches. 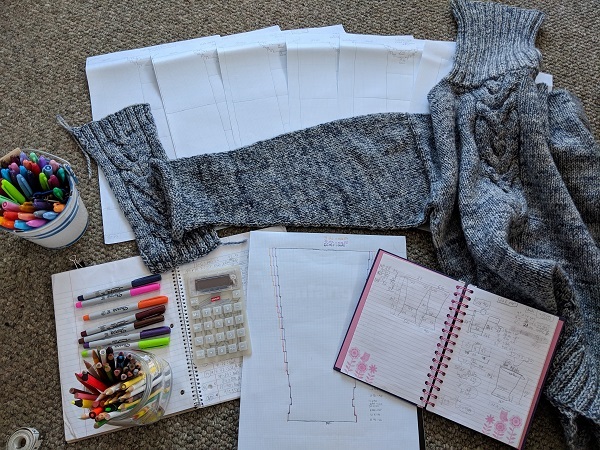 The pattern is at test knitting stage at this point and will be published later this year. 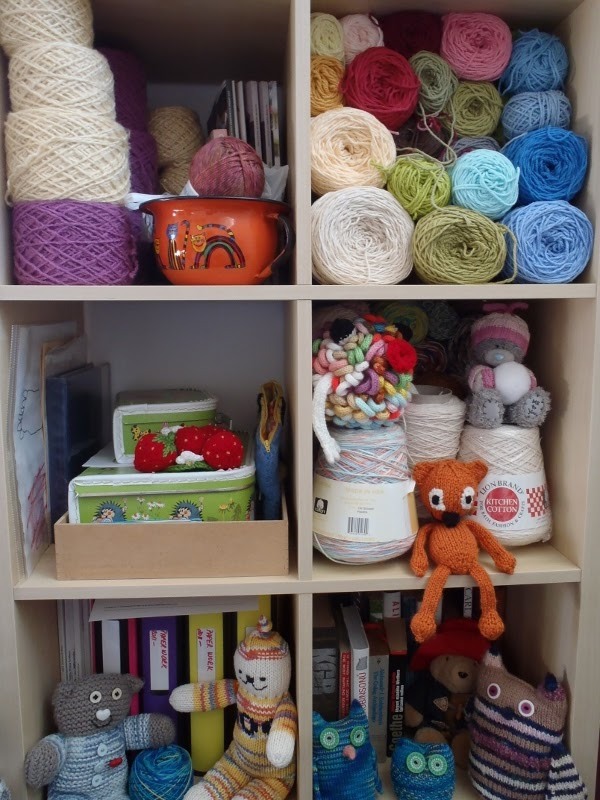 Today I also tried to get a bit organized in my knitting world. I am not sure how successful I will be, but I needed to clear my table with all the paperwork. I work better when things are a bit more neat and organized. I tend to do this periodically. I organize my projects, my yarn, my paper work. Then I reorganize everything again. 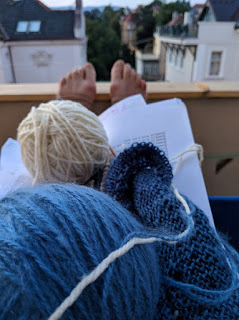 During this time I usually pick yarn for a new project that I want to work on next. In a few days this little blog will have an anniversary. I have been writing here for eight years. Frankly I didn't know what to expect in the first place. I started the blog with a help of my friend, and continued on the journey, unsure what to hope for. Somehow it stayed alive, survived and continues to exist. There were more visitors in some years then are at this time, but that was because of the free pattern for the Minions. The Minions are not as popular as they were once. It is interesting how popularity changes with time. It seems that what is hot right now changes faster than in the previous years. Sometimes I long for the slower days of the past, when everything took longer and we were more satisfied with the finished results. In the present days of instant gratification it seems to me that there are fewer and fewer things that can bring this sort of satisfaction. On a whim I have created a coupon code this past Friday valid through the weekend. 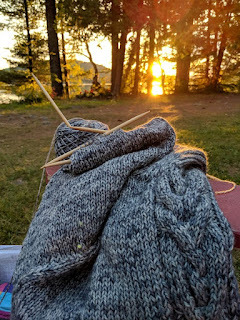 I wanted to post about it here on my blog, but this weekend was one of those rare slow weekends when I had time to bake a bread from scratch, leisurely cook delicious meals for my family, and even knit a lot. I wanted to finish a wrap so I can give it to its recipient. I have the notes and will in time write up the pattern, though it's probably fourth or fifth pattern in line to be written up. I stayed away from the electronics most of the weekend, and therefore missed the opportunity to let know the readers of my blog about the promotion. So I have decided to create a new promotion, it's valid from today until February 28th, midnight of Eastern US Time. 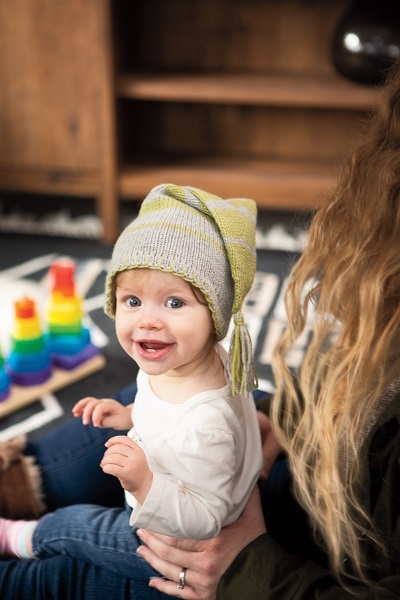 Everything takes time, especially knitting. You make your masterpiece one stitch at time. 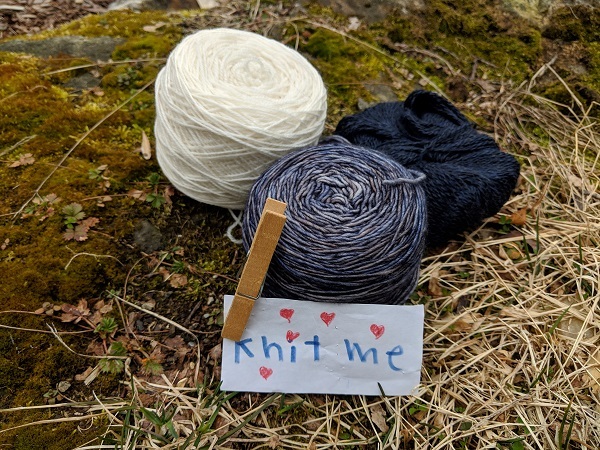 Happy knitting, and thank you for visiting and reading my blog. It has been a while since I wrote my last blog post. 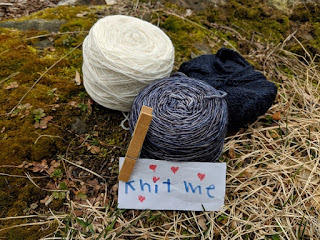 I didn't stop knitting. I had few projects to work on for a third party, which should be released later this year. I cannot share pictures of these projects with you until the patterns are published. Our Cats KAL continues in my Ravelry group and should be finished by the end of this month. There will be a grand prize for the winner to choose my next toy knitting pattern that I will create. 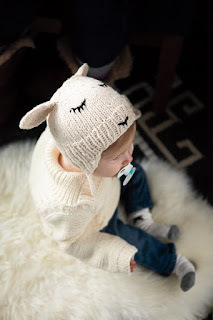 For all participants there will be an option to win one of my knitting patterns. 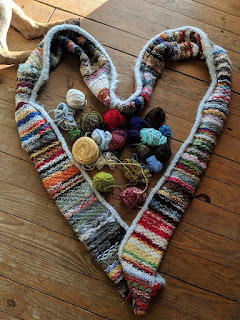 Over the month of February I am trying to participate in the Instagram month long challenge hosted by @Yarnlovechallenge. But like with everything else, sometimes things don't work according to plan and I have to improvise. I also knitted another dog pillow. 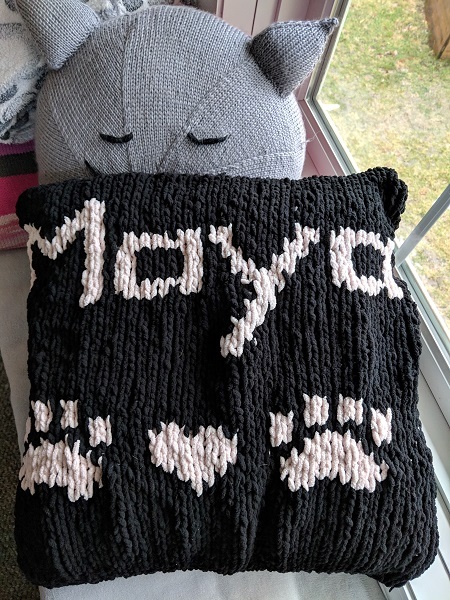 A friend asked me to knit one for her sister's dog. These pillows were fairly quick knit, since both were done in bulky weight yarn. 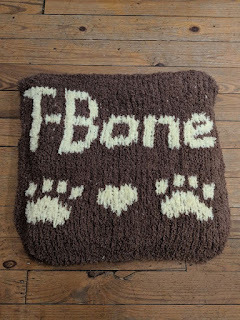 The longest part of these two dog pillow projects were to chart out the dog's names. 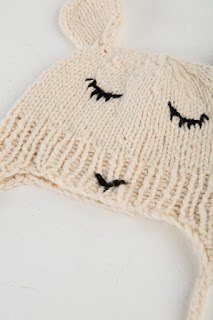 I am thinking about creating a pattern for the pillow, but it needs some adjustments. The bottom part of the pillow is generic and will fit for any dog, however the top part where the names are is rather specific and I am not sure how to address this part. Shall I leave it just blank, or shall I create some dog's names charts, or charts for the letters only. I need to think about this project for a bit. Bellow are the two pillows that I knitted so far. near and far - without you my life would not be as fulfilling. Thank you for being my friends. You are in my thoughts even if we don't see each other.